Lately we have expanded our in-house quality control laboratory with a loading table for both, mechanical-static and dynamic testing. Modules can therefore not only be subjected to a load test alone, but also in conjunction with mounting systems. As a result, our in-house quality control becomes even more closely meshed, so that our customers can rely on a permanently high system quality, which is checked independently of manufacturers. With the new procedure, wind loads with pressure and suction forces as well as the weight of snow loads up to 5,400 pascals can be tested. To make the test as close to reality as possible, modules are tested together with mounting systems. Inclinations are possible to simulate the installation on pitched roofs. 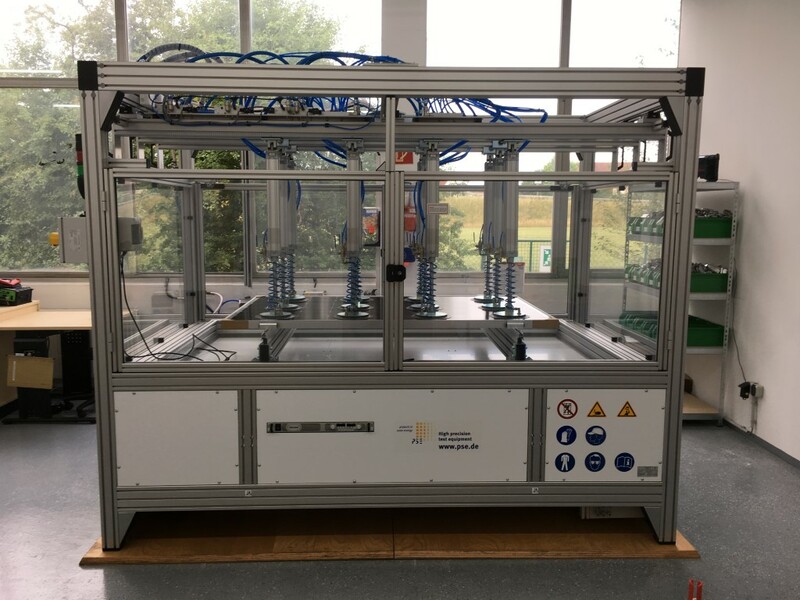 In order to pass the test, the modules must not show any deformations, breaks, detachments, micro cracks or power losses after the six-hour load cycle. 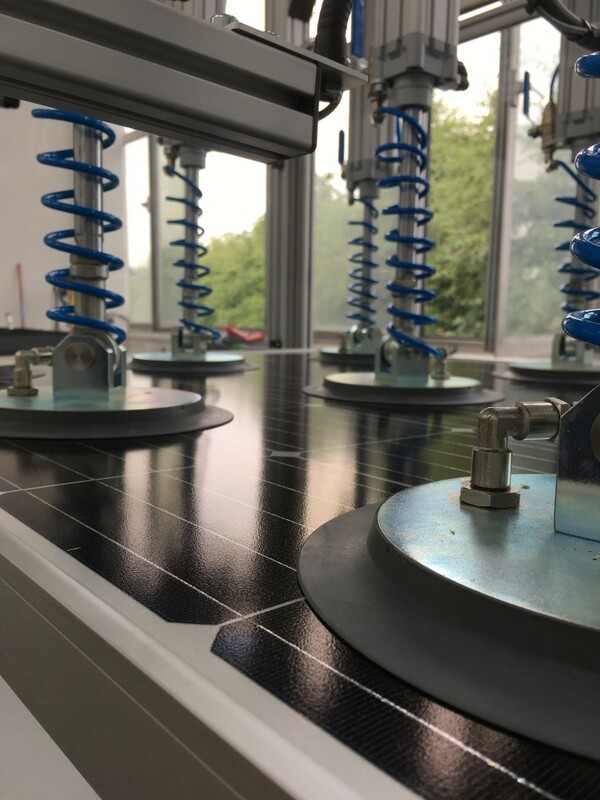 Mechanical-static testing according to DIN EN 61215-2:2017 supplements the existing quality controls, which we carry out in our own quality control laboratory on modules of our own IBC SOLAR Line brand and on modules by third-party manufacturers. Even before product launch, but also upon receipt of goods, the modules are subjected to test series in climatic chambers, flashers and in a test facility. The dynamic testing goes beyond the static testing of the DIN standard and is additionally carried out for modules of our own brand. 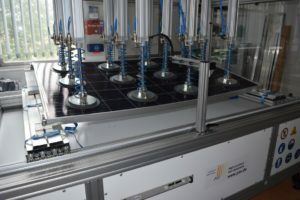 Here, a high-frequency test is used to simulate loads to see how extreme weather conditions affect the modules over the course of several hours, for example. In practice, extreme weather conditions have increased over the past several years due to climate change. PV plants are subjected to huge wind loads more frequently. Here, too, the interaction of modules and mounting systems is decisive for the resilience and therefore longevity of the PV systems. The expansion of in-house quality controls is a reaction to various developments of the PV market. 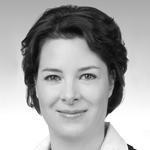 It enables a quicker reaction to product changes on the part of the manufacturers. A typical example for this is declining frame sizes, which can not only have an effect on the stability of the modules, but also on the mounting system.